Mohamed al Daradji's film "Son of Babylon" has been selected for this year's Sundance International Film Festival -- only the second Iraqi film in the festival's history. London, England (CNN) -- Mohamed Al-Daradji has cut something of a lonely figure in Iraqi cinema over the past seven years. The 31-year-old, British-educated Iraqi is one of only a tiny number of directors to successfully produce a homegrown feature film in the chaos that followed the 2003 U.S. invasion. His 2006 debut, "Ahlaam," set amid the madness of occupied Baghdad around this time, rather fittingly follows two patients who escape from a lunatic asylum. It was Iraq's Academy Awards entry in 2007. With war, an insurgency and a general mistrust of cameras by both Iraqis and American forces to contend with over the past seven years, it's perhaps unsurprising that "Ahlaam" is one of only three films to have been made in Iraq by Iraqis since the war. But now, things could be changing as a crop of Iraqi films showing at film festivals around the world this year indicate a resurgence for the country's beleaguered filmmakers. Daradji is leading the charge with sophomore effort, "Son of Babylon." The drama had its world premiere at the Middle East International Film Festival in Abu Dhabi late last year, and is slated to show later this month at Robert Redford's Sundance International Film Festival -- the first Iraqi film ever in the prestigious indie film festival's history. "Son of Babylon" is not the only Iraqi-made film to find success recently. Shawkat Amin Korki's Iraqi-Kurdistan drama about a multi-ethnic football match in contemporary Iraq, "Kick Off" was among films awarded the illustrious international film critics' (FIPRESCI) award in 2009. Meanwhile, Oday Rasheed's second film "Qarantina" has been selected to show at Rotterdam International Film Festival later this month, and Hiner Saleem's "Apres La Chute" showed at the Dubai International Film Festival in December last year. 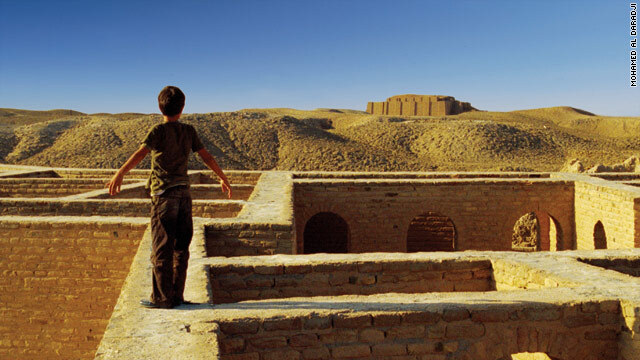 "Son of Babylon" focuses on a young boy and his grandmother who, in the aftermath of the 2003 U.S. invasion, leave the northern Kurdish region and head south across Iraq in search of a shared relative who has been missing since the first Gulf War: his father, her son. Their journey passes through a fractured country, full of anger but alive with humanity. The film's message is one of reconciliation through facing the horrors of a country's past, but it also highlights the ongoing search for more than one million Iraqis who went missing under Saddam's rule. I based the story on my aunt. She never found her son after the Iran Iraq war. "It's about the past and present of Iraq," Daradji told CNN. "I based the story on my aunt. She never found her son after the Iran-Iraq war. When I was preparing my first film, I heard about the mass graves at Babylon and thought about my aunt, a mother searching for her son." Although Daradji isn't Kurdish, he made his lead character a Kurd to heighten the sense of confusion as she traveled through a country whose language she couldn't understand. In many ways, Daradji and other emerging figures in Iraqi cinema are also in unknown territory. "Before the war there was no real independent cinema," Daradji said. In Iraq today, only three working cinemas exist, he points out. "After the fall of Saddam we had the freedom, but the violence and occupation made it almost impossible." Yet, he still managed to complete "Ahlaam" despite incredibly difficult circumstances, captured in the documentary he made about the experience, "War, Love, God and Madness." "The main thing is security because in my first film, I had a lot of problems with security," he said about the making of "Ahlaam." During that shoot Daradji claims he and his crew were kidnapped by militias twice and then arrested by the U.S. army on suspicion of making al Qaeda propaganda videos. Things were a bit different for "Son of Babylon," though: "Thanks to the Iraqi army and police we had very good protection this time. We always had our hands on our hearts but not a single shot was fired at us." Fellow director, Korki, faced similar problems during production on "Kick Off," which was plagued by kidnap threats and shootings. "During shooting the film we could hear the horrible sounds of explosions," Korki told CNN. "We where threatened by a group of terrorists; they announced that they were sending a car full of TNT (explosives). The crew was in a mental collapse." Both agree, though, that the major stumbling block for Iraqi filmmakers today is funding. Daradji had to rely on funding from the UK Film Council and a host of international organizations to make "Son of Babylon" a reality. "In 2008 when the security in Iraq improved we thought, 'Ok, we need funds now,'" Daradji said. He told CNN that he applied to the Iraqi Ministry of Culture for funding, but was turned down. "I believe that if there was good financial support, if the government helped us, we could start to prepare and make films and do something important." For Daradji, investing in film is every bit as important as investing in security or water or power for building the future of Iraq. "A lot of my culture is based on revenge not forgiveness," he said. "It is not easy to forgive. So, what I am asking is for us to talk about the past, not forget it. But we need the power to forgive."